I had Wayward Winter once, a year ago, at a craft brewing festival somewhere along the coast of Lake Michigan. I was there for a weekend visiting family and taking a short vacation from work. My mom and dad thought that checking out the festival would be fun--it was. Trying new beer is always a blast. 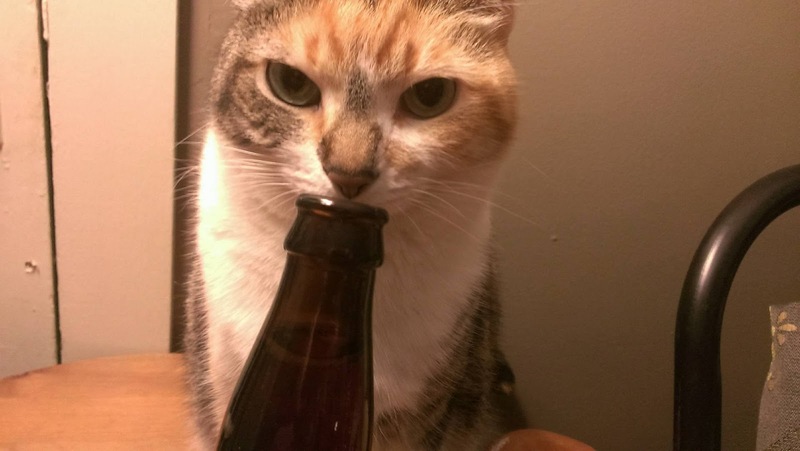 However, a lot of the beer was pretty average. There were a few cider companies there too, and the majority of these were fairly average, as well. I did find a single, brightly shining light, though: Armada's Blake's Hard Cider Company. I only had enough tickets left to snag one of their styles. 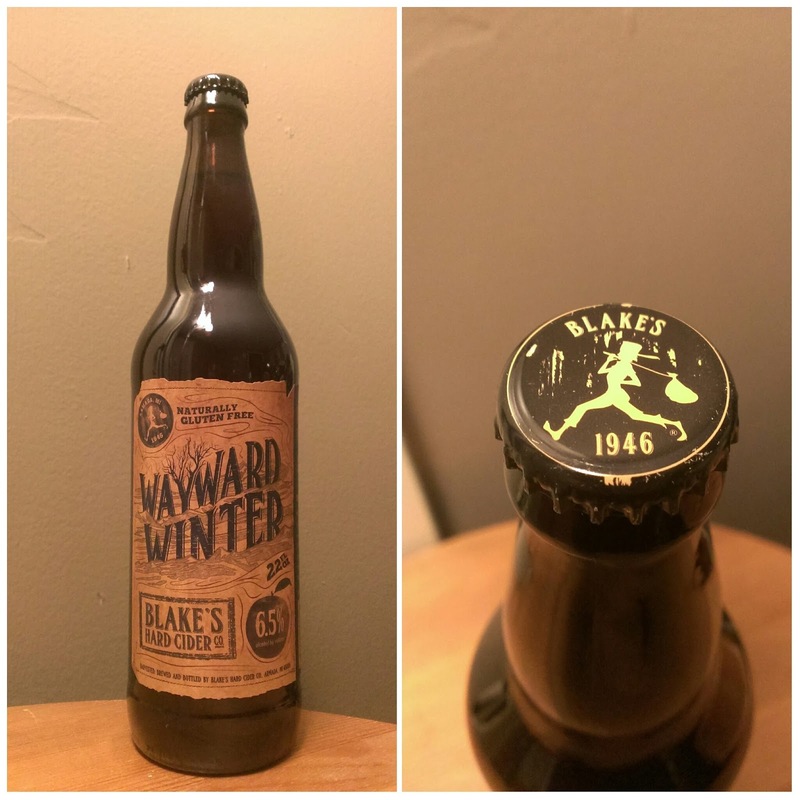 I chose Wayward Winter; I had seen people carrying around glass of a mysterious red liquid and as soon as I discovered it was offered by Blake's, I had to have it. I was not disappointed. I discovered a sourness with a distinctly maple quality. Later, I learned that Blake's was distributing cans of their ciders--but only in Michigan. I was bummed that Wayward Winter was a seasonal brew, but happy grab a six-pack of their cider whenever I was in the state. When I saw on their Facebook that Wayward Winter was once again available, I begged my parents to grab me a bottle when they went up to visit my mom's relatives. Much to my surprise, they gifted me six twenty-two-ounce bottles of the stuff for Christmas (my dad said they bought all that the store had!). Is it as good as I remember? Unfortunately, Blake's' website doesn't have a lot of information on the company. The orchard's been producing apples for sixty-nine years and has forty-two different varieties of the fruit, and Blake's offers nineteen styles of cider (a paltry three of which I have tried). There are a few embedded YouTube videos where bearded man talks about how Blake's makes hard cider in the tradition of pre-prohibition era cider. While it's a fun site upon which to waste time, I wish there was more of the company's history--I honestly thoroughly enjoy their product and want to learn more about them. Wayward Winter's online description (which you can find by clicking the above hyperlink and scrolling down) mirrors that on the bottle. It has an ABV of 6.5%, it's brewed with elderberries (hence the sourness and redness I've noted) and coriander, and it's more sweet than dry. Nothing about maple (though I can now account for that; traditional English cider is brewed with maple syrup, and that must be how Blake's makes this). The seasonal cider smells apple-sweet with a sour-elderberry punch. The first whiff I took had a heavy alcohol punch, but that dissipates pretty quickly upon my nose's return. It's inviting, regardless of what Purrl cat thinks (for those wondering she twitched her nose at the cider a mere four times before turning away) (Háma, my other cat, gave it five whiffs, but his opinion doesn't count [yet]). True to my memory, Wayward Winter is sour in front with a secret sweetness hanging around in the back. The mapleness is present, too. I can taste the coriander in the cider (yes, I have tried the stuff and can now successfully identify it)--there's a freshness about it that can be attributed to the spice. I am pleased to say that this tastes exactly how I remember. Although there's a slight carbonation to the cider, I would never consider it to be "bubbly." "Juicy" is a better adjective. This is straight-up hard cider. No extraneous fluff. Just like how Blake's intended it to be. 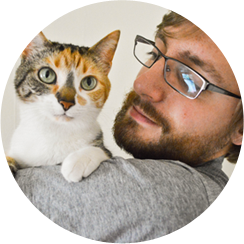 For much of my life, I've dealt with seasonal affective disorder (as have many people). As such, I don't have many happy winter memories. Drinking this cider, I recall one snow day, while I was in elementary school, when I worked with my friend across the street to build a killer snowfort in his front yard. Why were we building a snowfort? I have no idea. It's not like we were apt to engage in a snowball fight with other neighborhood kids. We just felt like building a snowfort. Anyway, my mom had a great idea of filling old chocolate syrup bottles with food-colored water for us to create designs on our fort (thereby further customizing it). So, we attacked the thing with streams of red, blue, and green. In reality, we just created colored wave designs on it, but to us, at the time, we were branding it with a warning to enemies: leave us alone. Upon the customization's completion, we retreated indoors for hot chocolate. This cider lets me relive that snow day. 10/10. That's what I give Blake's Hard Cider Company's Wayward Winter. You can only find it in Michigan during the winter, but you would be a fool to live there (or even visit) and not try it when you can. It's one of my all-time favorite beverages.